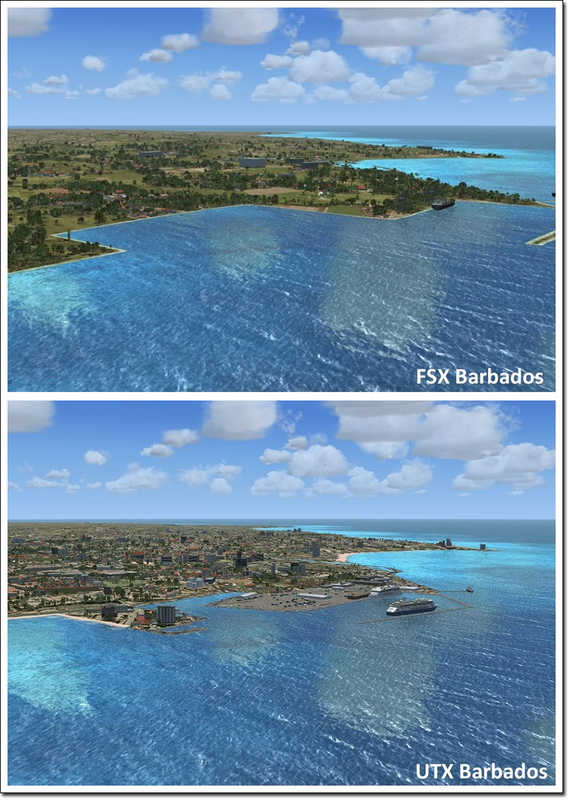 Product information "Ultimate Terrain X -Tropical America and Caribbean"
The most complete scenery upgrade for Flight Simulator X yet. Professional quality data means new roads, rivers, coastlines, railways and urban environments bring a new level of realism - day and night! Ultimate Terrain X has been designed from the ground up to take advantage of the new technologies in FSX, and provides the most superior and complete large terrain environment to date. Using only the very highest quality commercial-source data, Ultimate Terrain X takes FSX’s terrain environment to new levels not seen before in a PC-based flight simulator. Having improved road textures is nice. But what really make roads stand out with Ultimate Terrain X is the attention to detail, using road encasements and custom ground polygons for the interchange areas. This makes a huge difference in the urban road appearances. For every major road and highway that crosses a water feature in Ultimate Terrain X, a 3D bridge is displayed. There are thousands of these bridge features in the USA alone. Anyone familiar with the previous editions of Ultimate Terrain knows that the product uses premium commercial water data available for each region. This water data is the most accurate and detailed data available at any cost. Ultimate Terrain X takes coastlines to a whole new level, by including higher resolution rocky coastline textures, sandy beaches, concrete piers, freshwater dams, and man-made breakers. The coastline textures blend the edges of the water bodies with the land. 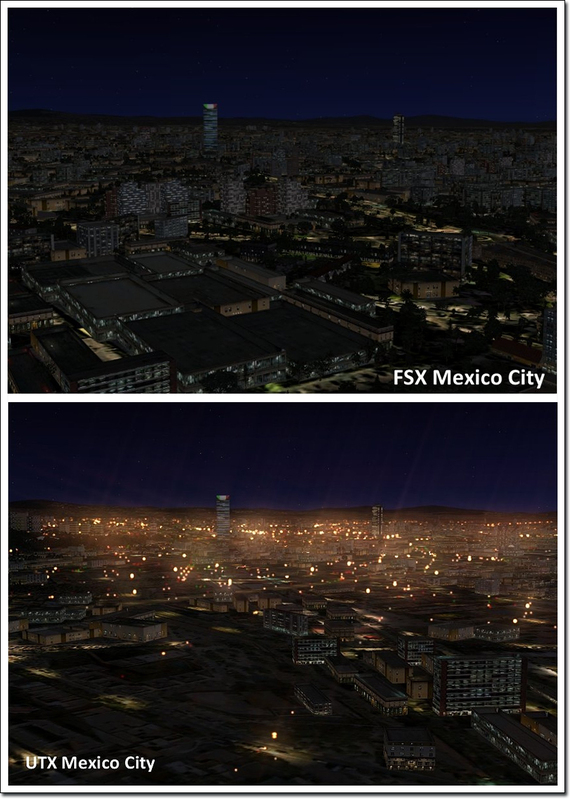 In the major metropolitan areas, FSX improved the body accuracy and details compared to FS2004. But outside of the metropolitan areas, there are still major missing water features and inaccurately positioned features. Ultimate Terrain X adds detailed water features throughout the entire region! In addition to the quality source data, brand new water features add more variety to the coastlines with waterclass options that will change the water colour associated with lakes, rivers and oceans. Ultimate Terrain X also takes advantage of Flight1’s new "Radial Elevation Theory" algorithm, which allows for nicely channelled rivers that cut right through areas of extreme elevation changes. 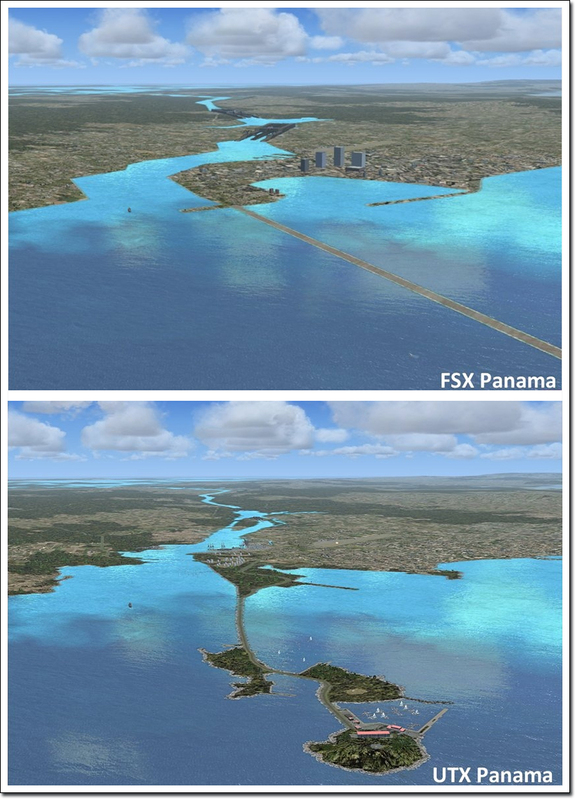 This new algorithm virtually eliminates the sloping water problems that are common with terrain hugging rivers in Flight Simulator. 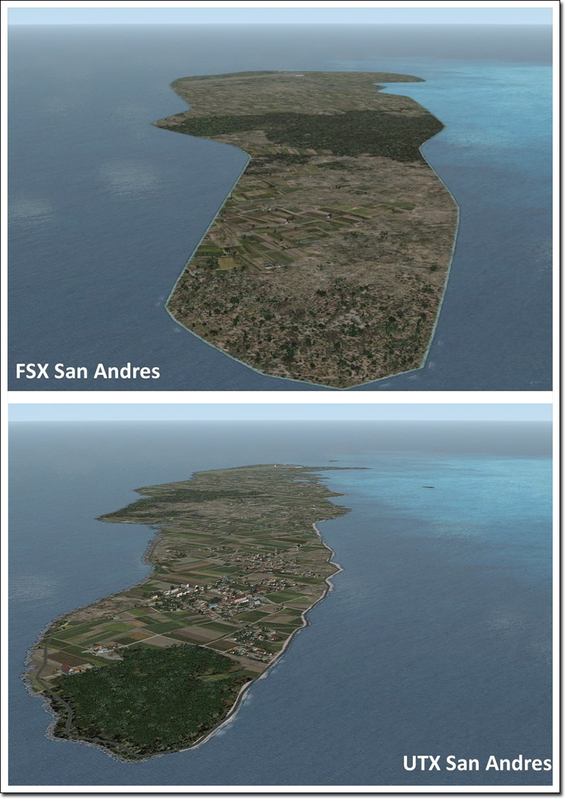 Ultimate Terrain X dramatically improves the accuracy of cities in FSX using Flight1’s proprietary "Synthetic Landclass" generation system, which generates urban landclass based on recent commercial data sources. This makes urban sprawls or rolling countryside and woodland appear just as it should - making visual flight even more compelling whatever the season. Waterclass options are a unique feature of Ultimate Terrain X that controls the coloring and style of the water features for various locations around the world. Ultimate Terrain enhances the default FSX water by providing new water textures giving new blues, greens and browns as you’d see in real life. Water colors can vary dramatically between seasons. And, many users have different opinions on how their water environment should look. Ultimate Terrain X is powerful enough for users to control their environment with multiple options. Railways are improved using higher resolution textures, railroad track encasement textures, railyard ground textures, and tunnel entrances. A 3D bridge object is also placed where all railroad tracks cross water. Ultimate Terrain X night lighting consists of points of light that represent things like street lights, intersection lights, and vehicle lights. They look great! 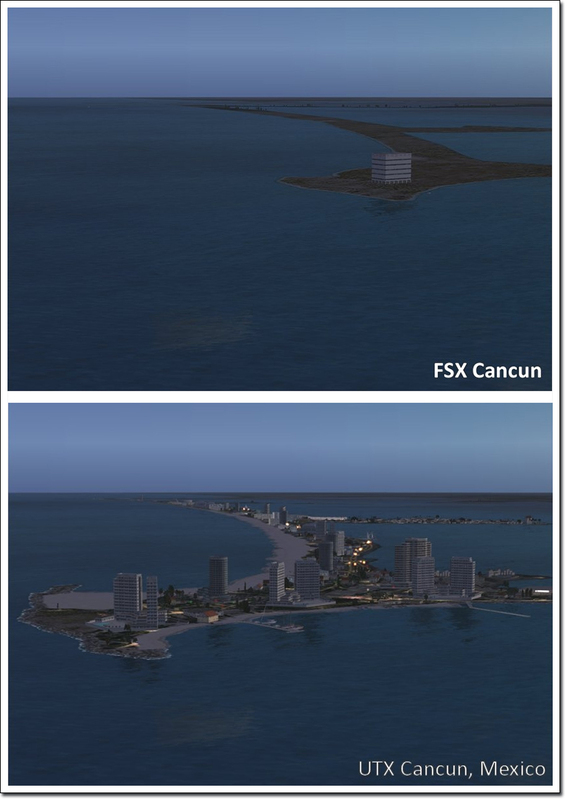 Improvements with Ultimate Terrain X gives: brighter lights against the very bright FSX background, prevent autogen reduction, eliminates "floating lights" from differing mesh products. Beaches – Glaciers – Cemeteries - Highway Interchanges - Tunnel Entrances - Railroad Yards - Small Islands - Parking Lots - Grassy, Forest, or Concrete areas for landmark features. To make sure that the current custom FSX objects line up with the new scenery data, Ultimate Terrain X repositions many objects to better align with road and water features. This includes things like buildings, ships, docks, and custom bridge objects (e.g. the Golden Gate Bridge). Ultimate Terrain X was designed from the ground up, to provide a near total configurable environment. Advanced users will marvel at the fact that they can have different textures assigned to nearly every Ultimate Terrain feature. For example, you can change the sizes of things like stream widths, road widths and coastline widths using the new Setup Tool. The tool also allows novice users to get up and running quickly whilst letting the advanced user have unprecedented configurability over their Flight Simulator X environment. Related links to "Ultimate Terrain X -Tropical America and Caribbean"